The best dating and business advice in the world can be summed up with the statement, "A man's actions speak louder than words." I don't know Donald Trump, but I met him once — at my wedding — where I personally both heard his words and witnessed his actions at play. He'd allowed me and my now-ex-husband to hold our reception at Mar-a-Lago — his residence/private country club — even though neither of us was a member nor would we possibly ever be able to afford to join. Not only did he allow us to use the facilities, but he gave us a discount so deep it cost less than if we'd chosen the local Sheraton. He instructed his staff to make the kitchen Kosher for that day (NOT a minor undertaking in any way). He even showed up toward the latter half of the reception to wish us well. He didn't walk in to claim the spotlight or positive press. There was no press. He stayed toward the back of the room so as not to pull focus from the celebration. When we greeted him, he was the picture of gracious, authentic respect. He fawned over the bride as anyone who's ever gone to a wedding knows they should. He congratulated the groom with a solid handshake. He spoke with us for as long as we wanted to, posed for pictures with us (not with anyone else), politely said goodbye, and made his exit. Everyone we worked with planning the event was pleasant, (again) respectful and happy to be doing their jobs. Not one note of impropriety or "creepiness" to be seen. That was neither my first nor my last interaction with the staff at Mar-a-Lago. In my work for a charitable organization, I dealt with them in relation to multiple events we held there. Each communication with his professionals was of the highest standard — utterly sincere, fluid and peaceful. I'm not sharing this to brag, but because it's the reason I'm able to sit here today — looking through newsfeeds, reading my friends' true heartbreak and fear — and feel optimistic. Because I have a feeling Trump's going to surprise us all. There are so many stories out there about the guy, both good and bad. I'm going to focus on one that feels particularly close to home — the story of Mar-a-Lago's transition from a standard grand mansion on uber-exclusive Palm Beach to that island's most inclusive country club. "The Island" was originally established as a resort for the Flagler family in 1902 and has grown to become one of the favorite wintertime playgrounds of millionaires and billionaires alike. Mar-a-Lago was built in the 1920s by Marjorie Merriweather Post (owner of General Foods, Inc), who interestingly left the estate in her will "to the U.S. Government as a retreat for presidents and visiting foreign dignitaries." The government chose to deed it back to her family in 1980, and Donald Trump purchased it in 1985. The history of Palm Beach is riddled with stories of discrimination based on race, class, and religion. Many of these stories are difficult to prove, largely because the discrimination practiced in such upper crust neighborhoods is highly covert. As one example: "In 1965 the Anti-Defamation League of B’nai Brith (ADL) picked The Breakers for its first test of the Civil Rights Act, asking the Department of Justice to bar the hotel’s practice of discrimination. The ADL sent written reservation requests, some with Jewish and non-Jewish sounding names; those sounding Jewish were denied reservations that were given those with Protestant-sounding names. At first, The Breakers denied the charges; months later the hotel agreed to abide by the existing civil rights discriminatory policy." The first policeman steps out of the car. 'Where are you headed?' I tell him I'm on a bike ride ... What are you doing here?' I tell him I'm a law professor attending a conference at The Breakers ... The second policeman approaches. 'We've had some robberies here.' I'm incredulous at what's being suggested. Robberies? On a bike? On a rental bike? How am I supposed to fit a Sony flat screen on the back of a Huffy? Or plan my jewel heist at the mercy of a functioning kickstand?" Ridiculous and disgusting. Just inexcusable. Most tales of discrimination in Palm Beach involve the same country club culture — and that's where Donald Trump's story comes in. After purchasing Mar-a-Lago, Trump began work on transforming it into yet another private club. But unlike established old-school clubs, like the Everglades and the Bath and Tennis Club, membership to Mar-a-Lago would NOT be restricted to anyone based on race or religion. That's right. The Donald dared to establish the single-most liberally progressive club on the island of Palm Beach. According to The Washington Post, Trump received noticed from the town council that every aspect of club affairs — "membership, traffic, party attendance, even photography" — would all be severely limited and stringently monitored. His response was, quite frankly, brilliant. Calling out the fact that "local officials seemed to accept the established private clubs ... that had excluded Jews and blacks while imposing tough rules on his inclusive one," Trump instructed his lawyer to send "every member of the town council copies of two classic movies about discrimination: A Gentleman’s Agreement, about a journalist who pretends to be Jewish to expose anti-Semitism, and Guess Who’s Coming to Dinner about a white couple’s reaction to their daughter bringing home a black fiance." The limits on Mar-a-Lago were (for the most part) revoked. Trump's own recent statement about Mar-a-Lago was this: "No discrimination against African-Americans, against Muslims, against anybody. And it’s a tremendously successful club. And I’m so glad I did it. And I have been given great credit for what I did. And I’m very, very proud of it. And that’s the way I feel. That is the true way I feel." These words echo those he spoke quietly and with obvious sincerity to me and my ex-husband in 2002, as we thanked him for his generosity. There were no TV cameras. There were no reporters. We were not celebrities nor did we ever plan to become so. I'm not saying or implying Donald Trump is the Messiah. I'm not even saying he will be a good president. What I am saying is that there IS a chance that Trump may not be as bad as his days on the campaign trail have many of us thinking he will be at this moment. I am well aware he said vile and horrible things during his campaign for the presidency. Some of those things won over a segment of our population that truly frightens me, as it does many of you. Presidential hopefuls say A LOT of things. Politicians, in general, say A LOT of things. And many of those "things" prove to be entirely separate from the views and actions that manifest once they're in office. Last night during his acceptance speech, Donald Trump said many more things, and this time, they were beautiful. 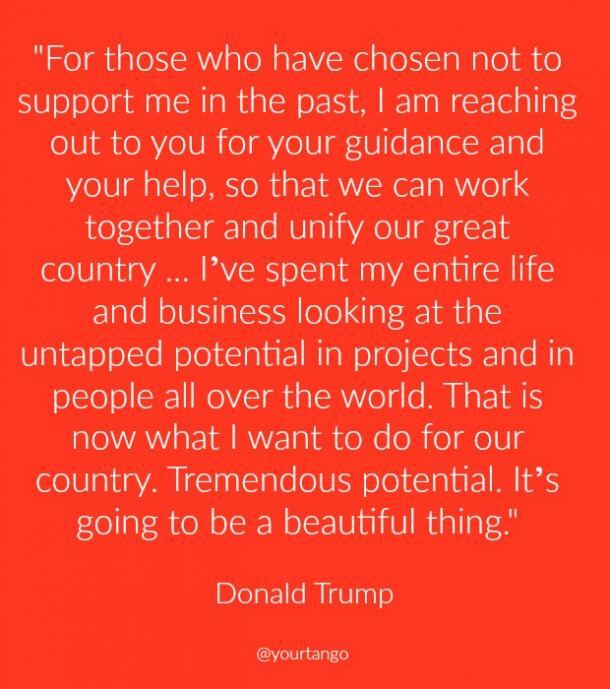 For those who have chosen not to support me in the past, I am reaching out to you for your guidance and your help, so that we can work together and unify our great country ... I’ve spent my entire life and business looking at the untapped potential in projects and in people all over the world. That is now what I want to do for our country. Tremendous potential. It’s going to be a beautiful thing." That is the man I met one brief time at my wedding. That is the man I have been waiting to see surface again throughout this election. I don't know if he's here to stay or not. I don't know what kind of President Donald Trump will actually turn out to be — and neither do you. Last night, I wholeheartedly liked what I heard for the first time in an extremely long time from ANYONE in a government office. Hard as I do understand it is, let's stay hopeful and see if just maybe we can build something truly beautiful together from out of the ashes.